SPRING LAUNCH! The boutique Vancouver South Creek Landing view residences are now here! Brought to you by Port Capital Development Inc, the False Creek Vancouver luxury condos for sale at South Creek Landing residences offers the perfect blend of first class living and artistry. Recreating the entire False Creek skyline, the luxury Vancouver South Creek Landing condo building will be an architectural master piece! The iconic design will make this mixed use building the area’s landmark development. From the commanding North Shore mountain views to the unparalleled panoramas of the downtown Vancouver skyline, the False Creek South Creek Landing condos will give its home owners a sense of community, pride and full satisfaction. This project will become the signature development in the area and is also ideally situated in one of the city’s most prestigious and most sought after neighbourhoods. The building as of Spring 2013 is already under construction and there are only a handful of suites still available at the luxury Vancouver South Creek Landing view residences. For more information about this False Creek Port Capital Development project, please visit their web site at www.southcreeklanding.com or call their sales team for more details about pricing and availability. The South Creek Landing penthouse unit is available but the floor plans are only available upon request. Ranging between 475 square feet to about 1,600 square feet, the prestigious Vancouver Westside condo project by Port Capital Development is garnering lots of media attention not only for its amazing False Creek location, but because of its iconic architecture. As the marketing reads: ‘an iconic design in a landmark location’. The extra spacious 1 to 3 bedroom floor plans at South Creek Landing Vancouver Westside condos are catered to professionals, singles, couples and even families seeking a winning location within the exciting and ever changing Cambie Corridor on Vancouver’s West Side neighbourhood. The immense potential of this district makes it extra appealing for those who want to live in a transit oriented area. From the Cambie Street Bridge which leads you straight downtown to the entertainment and business districts as well as its close proximity to Yaletown, UBC and Burnaby shopping/dining, the South Creek Landing Vancouver Westside condos are centrally located so that you can experience the entire city with ease. The incredible views overlooking the beautiful water ways and the cityscape skyline from every room at South Creek Landing in Vancouver Westside neighbourhood makes this project even more magnificent. In addition, the Olympic Village SkyTrain and Broadway-City Hall Skytrain stations on 2 routes are located within steps of your front door. This can lead you straight downtown or to the airport at YVR. Directly within your vicinity at the Westside Vancouver South Creek Landing view residences is a BC Liquor Store, Future Shop, Home Sense, HSBC, Milestone’s, Michael’s, RBC, Safeway, Shopper’s Drug Mart, TD Bank and a Tim Hortons. 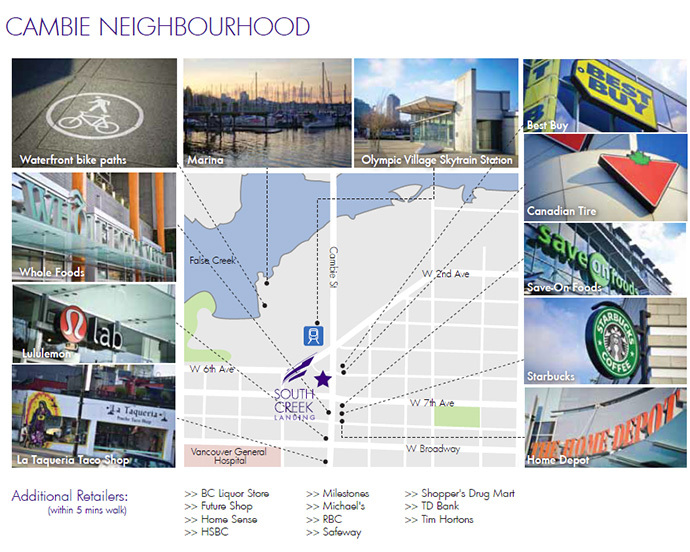 The Vancouver General Hospital, numerous parks, False Creek seawall, Whole Foods, Lululemon, Canadian Tire, Save-On-Foods, Starbucks, Home Depot and the False Creek marina are also within minutes of the South Creek Landing Vancouver Westside project location. Here are a couple of magnificent floor plans feature here. Please note that the South Creek Landing floor plans are subject to change at any time by the developer. Please check with the sales team in regards to availability and current pricing. What Sets These Homes Apart from the Rest? South Creek Landing offers a boutique project in a mid-rise concrete building in the heart of the Cambie Corridor False Creek Vancouver Westside neighbourhood. Offering 1 to 3 bedroom floor plans between 475 to almost 1600 square feet plus outdoor living, the South Creek Landing Vancouver Westside view residences give home owners amazing panoramic views of the North Shore mountains and the city skyline from most rooms. In addition, there are rare 2 residences per floor designs on the top levels, which give home buyers a highly desirable and liveable opportunity within the heart of the city. Every home has a view. Even the one bedroom homes have amazing downtown and mountain panoramic views. In addition, the Westside Vancouver South Creek Landing view residences have spacious outdoor living decks. The presale pricing is between $399,000’s to $1,468,000. From the South Creek Landing marketing online: South Creek Landing is an exceptional, quality development at the gateway to Downtown Vancouver. Don’t miss this once-in-a-lifetime opportunity.